Ed Balls has said the introduction of a temporary immigration cap appeared "reckless and chaotic" - after a High Court ruled it was done unlawfully. The shadow home secretary said the ruling meant the cap "does not, in fact, today exist". Minister Damian Green said the ruling was on a "technical" point and details would be set out on Tuesday allowing the temporary limit to be reinstated. 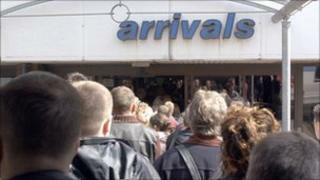 The temporary cap on non-EU skilled workers was introduced in June. Home Secretary Theresa May introduced the limit of 24,100 workers a month as an interim measure ahead of a permanent cap. But it was challenged by the Joint Council for the Welfare of Immigrants and English Community Care Association, which was concerned about the effect on people working in the care sector. Last week a legal challenge to it was upheld with High Court judges ruling that ministers had "sidestepped" Parliamentary scrutiny. The ruling nullified the current temporary cap. Immigration Minister Damian Green told MPs the ruling was based on a "technical, procedural point" and was not "critical of or prejudicial to the government's policy of applying a limit to economic migration into the United Kingdom either permanently or on an interim basis". He said he was "considering what steps are required to reapply an interim limit consistent with the findings of the court". He said changes to the immigration rules would be laid before the House on Tuesday, setting out the details the courts had required to allow the interim cap to be reinstated on a "clear legal basis". He also said he would be closing applications under the "tier one" route for highly skilled workers - because the cap had been reached. But Mr Balls repeated the judges' words that the home secretary had tried to "sidestep" Parliamentary scrutiny and said her actions were in fact "illegal". "As a result the government's much heralded cap, deeply unpopular with business, does not in fact today exist." He pressed Mr Green on what would happen to people who applied to come to the UK but were rejected under the "illegal cap". Mr Green said the court's written judgement would not be received by the government until January, so until they it could not decide whether it would appeal against the ruling. Mr Balls asked him to publish all the legal advice "on which their decision to proceed was based, to dispel the impression that he and the home secretary have acted in a reckless and chaotic manner and to show the home secretary in fact has nothing to hide". Mr Green accused him of "bluster" and said publishing legal advice was not something Labour had done in government. Another Labour MP, Frank Field - who is advising the government on poverty issues, said the cap on immigration had "huge support in the country". He added: "Of course if he was able to bring these measures within the law, that's an advantage but voters want to see the numbers coming down." Prime Minister David Cameron has said current immigration levels are not sustainable and called for net migration - the difference between the number of people entering the UK and those emigrating - to be reduced from nearly 200,000 a year to "tens of thousands". But the English Community Care Association said the temporary cap - which reduced by 5% the number of non-EU work visas issued - could have a potentially "catastrophic" effect on the care sector. As 13% of those who work in care homes come from outside Europe, it said thousands of staff from the Philippines, India and South Africa could be forced to quit their jobs and this could damage continuity of care.